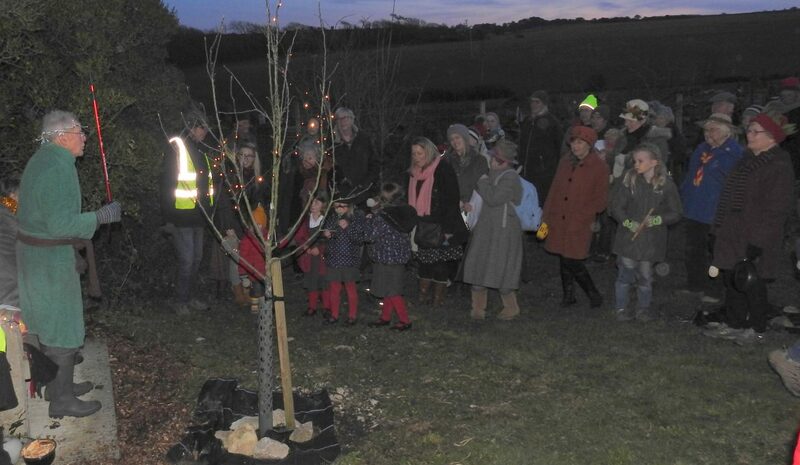 Langton Matravers Parish Council > Latest Parish Council News > Latest News > What a Wassail ! On 17th January, Twelfth Night according to the old Gregorian calendar, Langton’s community orchard played host to a motley range of about 50 visitors aged between four months and 80+ years old. Just after sunset a jolly procession, headed by a fiddler and accordion player and banging pots and pans and singing a wassail song, marched up the High Street, down Durnford Drove and through the Woodland Trail to the community orchard, Here the Wassail King poured cider over the roots of the trees, the children put toast on the branches, and everyone sang to the trees to encourage a good harvest in the coming year. A deafening clatter then ensued to discourage evil spirits, and everyone returned to the village hall for hot toddy and cake.